This recipe from the cookbook Allied Cookery is a lot like the oven dish from the Dutch Oorlogskookboek (‘War cookbook’): pasta, tomato, cheese, brown crust on top. This macaroni pie contains meat, as opposed to the vegetarian Dutch oven dish. This pie does not originate from the continent where the war was fought and where there was food shortage either, but instead comes from the other side of the Atlantic Ocean. Small differences like these result in a completely different dish. A century ago, in the middle of the First World War, two Canadian sisters published a cookery book “to aid the war sufferers in the devastated districts of France”, titled Allied Cookery. 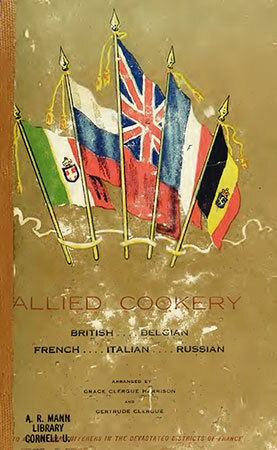 The cover shows the flags of the UK, Belgium, France, Italy and Russia, but the cookbook also contains recipes from Servia, the US, Canada, India, Poland and Japan (during the war of 14-18 Italy and Japan were part of the allied forces). The authors were Grace Clergue Harrison (1869-1944) and Gertrude Clergue (no known dates of birth and death). A French edition, La Cuisine des Alliés, was published in 1918. The recipes in Allied Cookery are not concerned with shortages in food or fuel, contrary to the recipes from the Oorlogskookboek, as the intended public was not living in war-stricken France, but in North-America. The book does contain a recipe for ‘Soldiers’ Soup’ or ‘Soupe à la Bataille’, but Allied Cookery was clearly not intended for the people on the battlefield. So, out of solidarity with Europe, one prepares Carbonade Flamande, Servian Podvarak (sauerkraut, lard and spareribs or a small turkey), Russian Shchi (soup with cabbage), Old English Plum Pudding, Crepes Suzette and even salmon teriyaki from Japan; dishes that war-stricken Eiropeans could only dream of at the time. The recipe for Macaroni Pie is listed in the chapter ‘Meats and Entrées’ in Allied Cookery. In the French version, the recipe is placed in a chapter with recipes for pies, cheese, eggs and vegetables. Three-quarters lb. of cold beef, or mutton, 1/2 an onion, 3 or 4 tomatoes, 1/4 lb. of macaroni, bread-crumbs, grated cheese, stock, salt, pepper, nutmeg. Cut the beef or mutton into thin slices, peel the onion and slice it thinly, slice the tomatoes, and boil the macaroni in slightly salted water until tender. Cool and drain the macaroni, and cut it up into small pieces. Line a buttered baking-dish with macaroni, and arrange the meat, onion, and tomato slices in layers on the baking dish. Season with salt, pepper, and nutmeg, pour over a little stock, and cover the top with macaroni. Sprinkle over some bread-crumbs, and grated cheese, and bake for about 20 minutes in a hot oven. I have replaced the cold beef or mutton with ground beef. Maybe there are still households where large pieces of beef or mutton are prepared, and where it is easy to save some leftover meat for this dish, but nowadays many people prepare microwave meals or portioned meat that only needs a short time on the stove. Because the ground beef has to be cooked before using it in the pie, I have fried it with the onion. So all in all my version is not quite the same as the original recipe. For this pie I used thicker ‘macaroni’, zita of the brand De Cecco. Why I use this pasta is explained here. According to the original recipe, the pasta is cut into shorter pieces after cooking, so you could also just use ordinary macaroni. The original recipe does not specify which cheese should be used, just ‘grated cheese’. In the adaptation I have opted for Cheddar, but I have also made this pie with Dutch Gouda cheese. 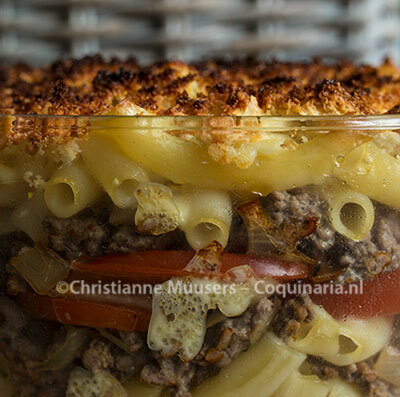 On Coquinaria, there is also my own version of Macaroni with cheese (as the recipe is in Dutch, please use Google translate). Main dish for 3 to 4 persons; preparation in advance 30 minutes; preparation 25 minutes. Chop the onion, wash the tomatoes and slice them thinly. Grate the Cheddar, or cut into small cubes. Heat the butter in a skillet. Fry the onion until light brown, then add the ground beef. Stir fry until the meat is done. Add salt, pepper and nutmeg and stock. Boil zita or other pasta according to the packaging, or follow the contemporary recipe from the Dutch War Cookbook (so, thirty minutes). Drain the pasta, return to the cooking pan with one tablespoon butter and the half amount of cheese. Preheat the oven to 200 °C/390 °F. Take a large ovenproof dish, and put half of the pasta in it. Cover it with onion/beef and sliced tomato in alternating layers, then add the rest of the pasta on top. Cover the top with breadcrumbs and the remaining cheese. Put the dish in the oven and bake until the top is brown, about twenty minutes. Place the hot oven dish on a fireproof coaster on the table. Serve extra cheese with it, and a bowl of green salad. Grace Clergue Harrison, Gertrude Clergue, Allied Cookery. G.P. Putnam’s Sons, London/New York, 1916. (online pdf).